Plastic Heating. Available Thermoforming Devices. Thermoforming digitally printed plastic is not only used to create signage but also for products in industrial markets like building and construction, transportation, and medical. 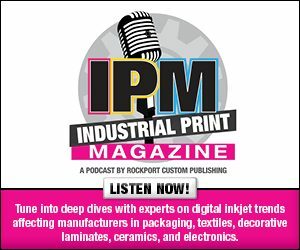 Manufacturers looking for a cost-effective and cohesive method invest in digital printing technologies as well as thermoforming devices. The Formech 2440 is a thermoforming machine featuring the intuitive Formech Cycle View user interface with a one-inch touchscreen. The device has a 30 second heating cycle for 0.040-inch polystyrene and can form most common thermoplastics up to 0.25 inches. “Particularly well suited to signage, point of sale, film and theatre set design, automotive, and aerospace applications, the 2440 provides ultra-fast response with energy efficiency quartz heaters and accurate heat profiling with 48 zones,” comments Nic Neath, sales director, Formech Inc.
Dual 400 liter vacuum tanks enable instantaneous vacuuming for definition and four high output fans provide rapid cooling to speed cycle times. For an additional cost, the Formech 2440 is available with several recommended options like a heating pyrometer, reducing window, vacuum flow regulator, and spare parts kit. According to Neath, the machine is available for $162,805. Multivac offers the R 245 flexible thermoforming packaging machine. It is a freely configurable device that processes flexible and rigid film as well as aluminum and other packaging materials with a thickness up to 1,000 micrometers and a 560 millimeter (mm) film width. It provides a maximum forming depth of up to 150 mm and a maximum cut off length of up to 700 mm. The SencorpWhite Ultra 2 thermoformer is designed for multiple industries looking for more precision and control of form and trim. It is equipped with a robust, heavy-duty rail transport system that allows users to use less material and produce less waste. The machine includes inline steel rule tools to reduce tool and labor costs as well as shorten production time. The Zed Industries, Inc. sheet-fed vacuum HD 2530 thermoformer is a single-station device with an 8×12-foot form area. It is designed for production runs and sampling of heavy gauge plastic parts such as trays, bins, machine covers, automotive and aircraft components, displays, signs, and luggage. Standard features include top and bottom moving platens, sandwich heaters, air or vacuum control on both platens, precision temperature controller, and PLC controls for repeatability. Zemat Technology Group offers the FORMA vacuum thermoforming machines dedicated to hard foil packaging and accessories production. Its PLC controlled automated functions allow short cycle times and optimum contour definition. FORMA thermoforming machines produce uniform, high-quality plastic packages and articles made from roll-fed thermoplastic materials like OPS, PVC, PET, and other thermoformable films. Depending on production demands, machines are equipped with specially designed finishing modules, like an automatic foil feeder. A number of thermoforming devices are available that are compatible with digital printing processes. These devices are designed for industrial production or a variety of products like trays, displays, food, and medical devices. Click here to read part one of this exclusive online series, Controlled Devices.